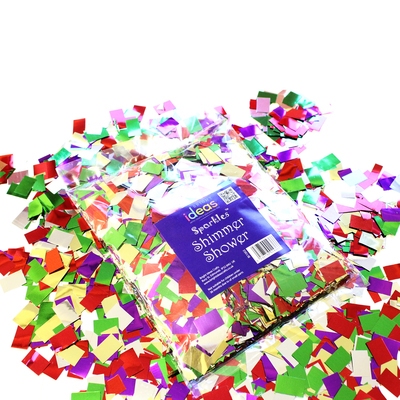 Watch as their eyes light up when they catch sight of this Shimmer Shower. A truly engaging addition to your Arts & Crafts resources, this versatile ticker tape has been cut into an assortment of different shapes and colours. It is fully compatible with a range of adhesives including PVA and paints while adding a captivating shimmer to every single project your class works on. With their pre-cut design, this shimmer shower is an ideal option for younger children with a lightweight design that is easy to use. Piece dimensions: 1cm x 1.5cm (approx).